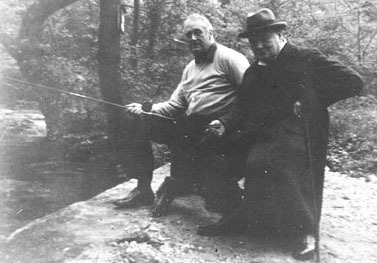 Angling for Utmost Fish with Roosevelt, Trout Run, Camp David, 1943. Q: What can you tell me about Churchill’s order for “Utmost Fish” in 1939. What did this have to do with his role as First Lord of the Admi­ral­ty?” —L.S, Spokane, Wash.
A: It had noth­ing to do with his role. It was char­ac­ter­is­tic of his atten­tion to detail, and will­ing­ness to stray out­side his lim­its.